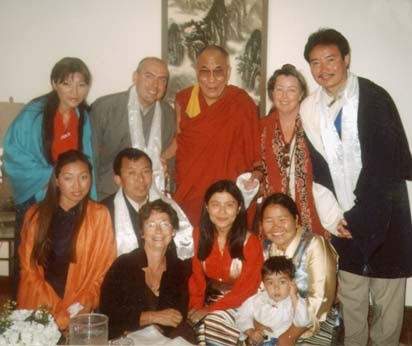 MENLO PARK, Calif. – His Holiness the 14th Dalai Lama, Tenzin Gyatso, spoke with Tsering Vassallo, President of the Bay Area Chinese and Tibetan Friendship (BACTF) group and other BACTF Steering Committee members on the morning of October 14, 2010. Ms. Vassallo presented His Holiness the Dalai Lama with a welcome note and a report on the history of the Bay Area Chinese and Tibetan Friendship group. “Very good, very, very good,” His Holiness said. He was keen on the BACTF members to be present at the dialogue planned later that afternoon with Chinese students and scholars from Stanford University, University of California, Berkeley and other institutions. “You’ll be there, right?” he questioned George Ge, the BACTF Secretary. BACTF was responsible to helping around fifty students and scholars and friends to join the later afternoon dialogue session with the Dalai Lama. Ms. Vassallo expressed her happiness to receive His Holiness guidance and his inspiration towards human value and religious harmony and hopes continued dialogue brings fruitful insights that helps others and provides for their well being. On March 10, 2010 five Tibetans and five Chinese were elected to the steering committee for one year. Tsering Vassallo was elected president, George Ge elected Secretary and Amalie Sinclair elected Treasurer. A BACTF general public meeting was held in Berkeley, CA in April 2010 and His Holiness’ Secretary, Chime R. Chhoekyapa informed us that the Dalai Lama hoped it was a “useful one in bringing the two communities closer to each other; to exchange ideas and building friendships. 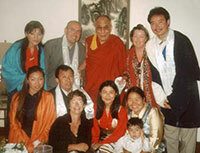 “The BACTF members were honored to receive this message and the Dalai Lama’s prayers and good wishes. In addition to meetings, public, and private discussions, the Bay Area Chinese and Tibetan Friendship participated in the annual March 10 Tibetan National Uprising Day and the June 4 Tiananmen Square Massacre Anniversary commemorations in order to remember and dialogue on notable occasions of Chinese and Tibetan peoples sufferings and to explore how to make the future together a better one. BACTF members also spent time outreaching to the public at community fairs such as the Himalayan Fair in Berkeley and the Silicon Valley Fall Festival in Cupertino, California, and to students at local universities such as UC Berkeley and Stanford University.